In my recent organizing frenzy, I came across one of my old sketchbooks/journals from high school. Even back then I combined the two. 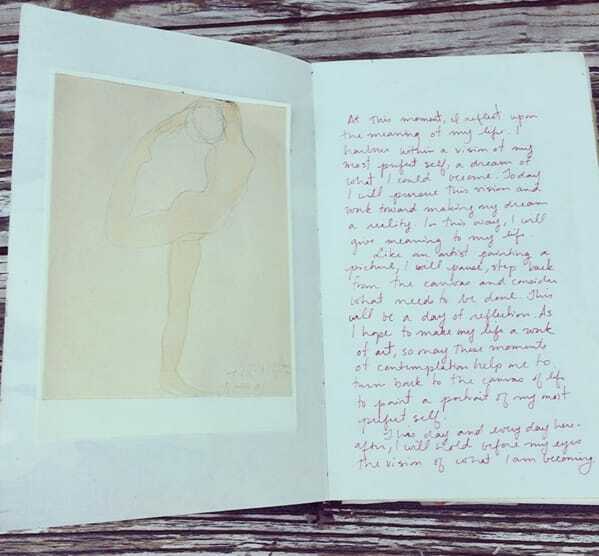 On the left is a postcard of one of Rodin’s dancing figures and on the right is writing that I remember copying down from some affirmations book I had come across. This journal of mine is from over 20 years ago, so I really don’t know where it came from. But strangely, it reflects a lot of what I have been thinking about in my current studio break. What does it mean to live the creative life? It’s not about just creating art and showing and selling, it is so much more. That is an aspect. For me though, it is a way of being, of living. If I were not showing and selling my work, I would still be living a crative life. I do believe this. I have been thinking more in terms of What do I want to create for my life and my family? At this moment, I reflect upon the meaning of my life. I harbor within a vision of my most perfect self, a dream of what I could become. Today I will pursue this vision and work toward making my dream a reality. in this way, I will give meaning to my life. Like an artist painting a picture, I will pause, step back from the canvas and consider what needs to be done. This will be a day of reflection. As I hope to make my life a work of art, so may these moments of contemplation help me to turn back to the canvas of life to paint a portrait of my most perfect self. This day and every day hereafter, I will hold before my eyes the vision of what I am becoming. Now, 20 some years later, I have let go of the idea of the “perfect self”- there’s no such thing and why would anyone have that be a goal?! That is a surefire way to disappointment.But the idea of always being a work in progress is definitely appealing to me. And being a work in progress, a vision is necessary. 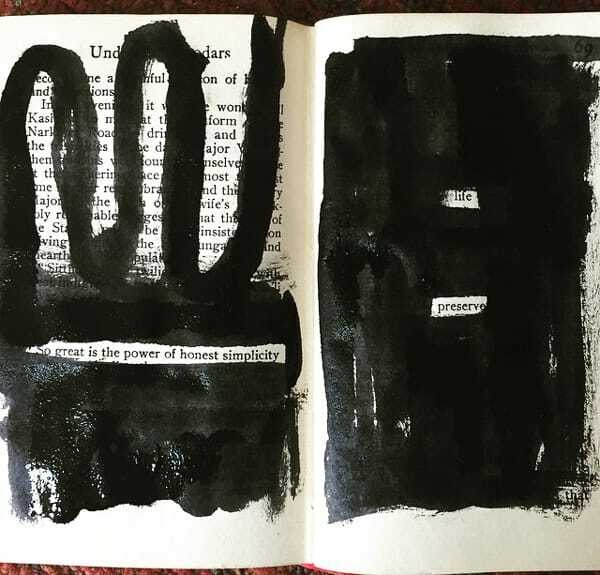 Many years ago, when I first met Judy Wise, in a small town in Wisconsin, she gave the advice of coming up with a personal mission statement for yourself and your art life. Which can be one and the same or it can actually be separate. I have been thinking about that and in so doing, thinking about the things that bring happiness to my life and in so doing, bring meaning to my life. Here is my working list. This is more on a personal level, not my art goals/mission, but they will and do intersect. Creating home. I’ve lived in many places, many dwellings and each place has a piece of me. Home is very important to me. I may not have a grand dwelling, but it’s me. Filled with art, and books and pretty things and earthy things that all make me feel happy. Creating nourishment for my family. It makes me happy to feed them with my creations. Especially when the food comes from our very first vegetable garden. Now, if only my 5 year old would eat what I make! Creating life. I don’t believe in doing things to create memories, I hear that a lot. We do things and create experiences to create a life. Contributing to my community. I want to enrich where ever I am, in my own quiet way. Creating artwork that is personal, and yet universal. A message that can be understood and felt by just looking at my creations. 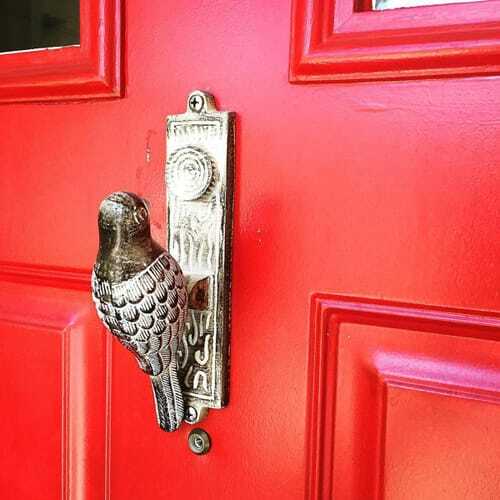 This door knock on our front door probably confuse all first time visitors to our house, as they search for the doorbell, but it makes me happy. I love this little bird. I’ve been taking photos of things that bring me happiness on IG. I haven’t been tagging them in a particular way, but they are definitely visual notes to myself. Honest simplicity seems to be the theme. And my art and the act of creating is my life preserve. I created this a few months ago in an old book I got at the used book sale at my local library.